When defending champion Argentine David Nalbandian met Frenchman Jo-Wilfried Tsonga at the BNP Paribas Masters final, not only was a Waterford crystal at stake, but also the last slot at Tennis Masters Cup in Shanghai. Moreover, Nalbandian was trying to become the first repeat titleholder in the event’s 23-year history. Urged on by his fellow Parisians, Tsonga defeated Nalbandian in a scintillating match 6-3, 4-6, 6-4. A supercharged atmosphere became even more electric when Tsonga after winning his service game at love, crushed a forehand down the line for a winner to get a break point. Nalbandian then donated the game by tossing a double fault. Subsequently, the Frenchman consolidated the break with a bullet crosscourt forehand winner in another easy service game 3-0. From that point on, the Argentine steadied himself and maintained the deficit at one break. As Tsonga served at 4-2, a forehand unforced error gave Nalbandian his first shot at getting back on serve. However, with a crisp forehand volley, Tsonga deleted the break point and secured the game with a terrific backhand volley. Serving for the set at 5-3, with great serve placement, Tsonga was able to draw the errors from Nalbandian and take one step closer to winning his first Masters’ shield. After leading 40-15 in the first game of the second set, Nalbandian lost his way when Tsonga made a volley and crosscourt forehand winners to get to deuce. Then, a few points later, David double faulted to give Jo-Wilfried a break point. 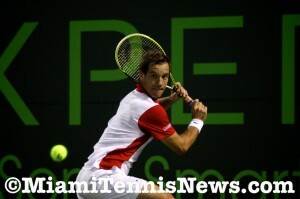 But, the steely Argentine erased the Frenchman’s advantage with an ace and secured the game with a forehand volley 1-0. While Tsonga put on a serving clinic, Nalbandian, one of the game’s best returners, continued to pile on the return errors. The Frenchman produced back to back aces to close out his games at love for 2-2 and 3-3. However, ahead 4-3, Nalbandian’s opportunity to break came with Tsonga misfiring on two forehands and making a double fault. Nevertheless, with aces and finesse at net, Tsonga escaped triple break point and equalized the set at 4-4. After holding serve at 5-4, Nalbandian again worked his way to triple break point. This time, the Argentine converted with a forehand error from Tsonga and took the set. Tsonga’s backhand had been ineffective the entire match with double digit errors and no winner. Nalbandian exploited that deficiency to hold serve at 1-0 in the decisive set. But, Tsonga returned the favor exposing Nalbandian’s weakness on the forehand side and with four consecutive errors converted a break point for a 2-1 advantage. From that point on, neither player was challenged on serve until the sixth game when Nalbandian got a break point courtesy of a backhand error which Jo-Wilfried then dismissed with his 24th ace. Serving for the championship, Tsonga appeared like he would crack again after making three consecutive errors to go down triple break point. Yet, Jo-Wilfried responded with three good first serves which led to a quality volley and a forehand down the line winner for deuce. Sparked on by the crowd, Tsonga produced his 25th ace for match point and with a forehand error from Nalbandian captured the trophy. After being kept out of the French Open and Wimbledon by knee surgery, Tsonga made up for his absence this week by beating Novak Djokovic in the third round, Andy Roddick in the quarterfinals and James Blake in the semifinals. 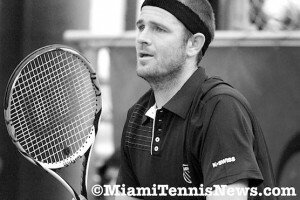 The Australian Open finalist culminated the season as he had begun, on a high note. Not only did Tsonga knock out countryman Gilles Simon from Shanghai, he jumped to number 7 in the rankings taking over the honor of top ranked Frenchman from Simon. Besides, Tsonga became only the third Frenchman to win this tournament, the last being Sebastien Grosjean in 2001. Despite injury getting the better of Rafael Nadal and Roger Federer in the quarterfinals, Nadal withdrew with a knee problem after being thumped in the first set by Nikolay Davydenko while Federer never took the court against Blake due to back spasm, fans were still rewarded with a high quality final.